As my wife accurately put it in her post of the other day, we ate a lot of interesting tapas during our time in Madrid. Several of these are specialities of the city and cannot be found elsewhere. We felt it our duty then, to give at least some of them a try. Long-term readers of this blog will know that while it’s not exactly a passion of ours, we do like trying less popular cuts of meat when we can, in the belief that anyone can make a filet of beef taste good, but only the skilled cook can make tripe or kidneys into a delicacy. We are pleased to report that we found abiding by these two philosophies (trying the local specialties and eating non-prime cuts) surprisingly easy and very enjoyable in Madrid. On our first afternoon in the city – at the same tasca we had the sepia a la plancha discussed below, in fact – we ordered some orejas a la plancha. Anyone who’s taken Spanish 101 will know that this means we ordered ears. Pigs’ ears to be precise, grilled or griddled and accompanied with a spicy tomato sauce the same consistency as ketchup or barbecue sauce. We did this knowingly too. Neither of us had eaten the ears of any creature before (as far as we knew) but decided that most meat products dipped in ketchup tasted pretty good. How were they, you ask? Well, very porky – like pork crackling, so crunchy on the outside – but also crunchy on the inside too, on account of the cartilidge that keeps an ear flexible but stiff. Oddly enough, they weren’t that chewy, but they were quite rich tasting and we found that with a racione (or large tapa usually for between 3-4 people) we had ordered more than enough. To sum up, I think we’re both glad we tried them and quite enjoyed their taste and texture, and would certainly eat them again, but we’re not raving about them, you know? Later in the week, after spending the morning in El Prado (perhaps the greatest art museum this side of La Louvre), we had a selection of tapas/pinchos as a late lunch. 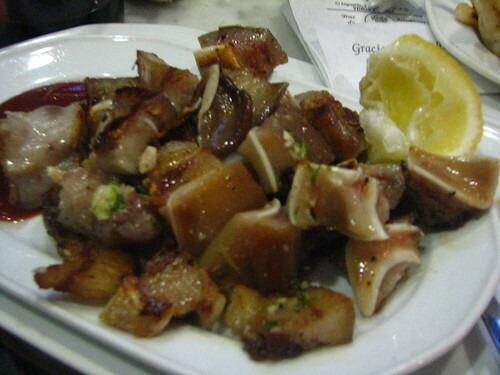 (Pinchos are tapas served on toothpicks and often on rounds of bread.) Amongst these was one I remembered having seen on TV once – fried anguilas (baby eels) with garlic and oil, (in this case served on a round of bread with a slather of garlic/lemon mayonnaise.) – on fatty chinless Andrew Zimmern’s show Bizarre Foods. Actually, unless you know they are eels, you’d probably think they were very thinly sliced calamari (calamares) or something, because they have a similar maritime taste and familiar chewiness. Zimmern made out that these were one of the most expensive treats to be found in Madrid, but we only paid Euro1.50 for it, which was kind of weird. Still, you should definitely try them if you get a chance (and are a lover of calamari). Don’t be put off by what they are or how they look. They’re a far cry from the British jellied eels that used to terrify me every time I entered a chip shop as a child. On our final night in Madrid, filled with sadness, at having to leave with only about thirty different tapas under our belts, and horror at how we would feel without jamon iberico readily available, we sought out a new neighborhood’s tascas to check out. 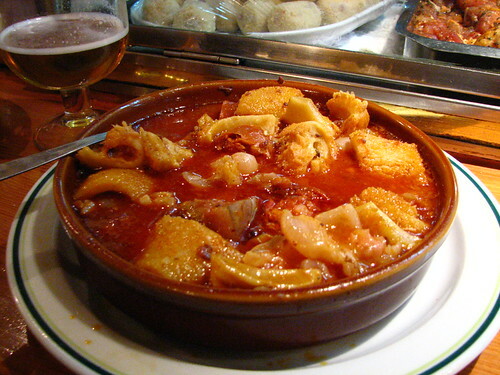 Entering the first one, which was filled with purple-nosed old men and a thick fug of cigarette smoke, we ordered callos a la Madrilena, or tripe in the local style. I’m a big fan of tripe (the lining of, usually, a cow’s stomach) – I really like it’s slightly gelatinousness and the peculiar cross-hatched texture of it’s underside – but I had no idea how this would be served. It came in a big clay bowl together with hunks of chorizo and pork fat in a spicy, reddish sauce. It was absolutely delicious, although no doubt not recommended by any cardiologists. Sure, it was porky and fatty, but the sauce was addictive and the chunks of chorizo added a spicyness to it that cut through the fat and made it too easy to a eat a lot of. Visitors to Madrid should by all means try this if you find it on a tapas menu, but understand that you’re going to have a devil of a time working it off in the gym when you get home! How do you feel about eating pig’s ears, baby eel or tripe? Do you know of any other interesting Spanish preparations using off-cuts? Check out the post that was written on some of the more tame tapas we ingested during our time in Madrid… you may be more inspired to eat them again after reading this post! Baby eels…that’s gotta be the best thing on earth. I haven’t had any in years!!! I love angulas too (baby eels) a true Basque speciality! 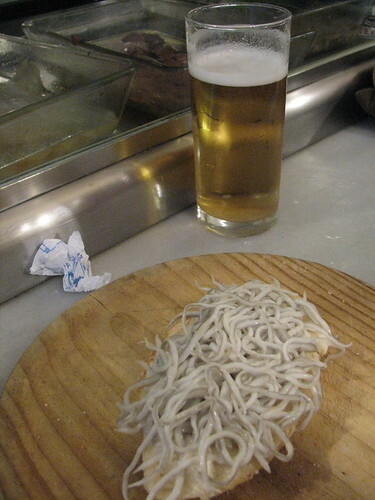 I think, most baby eels served nowadays in Spain, France or elsewhere are just imitations made from surimi. For Euro 1,50 you won’t get the Real McCoy. Similar to the “baby” salmons, turbots and the like which were fashionable in the decadent 80ies, real anguilas almost completely disappeared from the market due to a policy of sustainable fish choice. Btw: I would love to try soft shell crabs, but unfortunately they’re not available in Europe. So feel envied by a german seafood lover from Frankfurt. I loved this. Found this site after looking for a pig ear recipe. I loved the tapas in Madrid, and ate many of the above, and many more. Loved the tripe! Fatty? Maybe, but I do not eat bread /sweets, so I was able to eat all these treats and gallons of wine, and I actually came home lighter. I have no clue how. Maybe the walking or the clean food. I had the best pig ear at a place in the La Latina neighborhood. The place had pig ear in the name and “jaime” too. He was the owner and chef. Besides that the fresh grilled sardines and sweatbreads were killer. Madrid is an amazing “eats” city. Hi, Lynlee. Thanks so much for finding this older post of ours. After watching another Pedro Almodovar movie last night we were really reminiscent of this Madrid trip. I agree w/ you – there’s something about eating food that’s cooked from scratch that will never make you feel as heavy as you would otherwise. We actually made crispy pigs ears a la plancha but never put them on our blog. you must boil them first w/ some herbs for a long time and then you can just throw them on the flat-top grill and crisp away. Fergus Henderson also has a great recipe that is not a la plancha – he actually fries them. We’ve made those too. Very good. About the baby eels I can asure you, you have not eaten the real thing. Gulas is how we call the surimi stuff (5 euros a package of 200 grams) but angulas is an expensive thing to eat nowadays (1.000€/kg). We ate angulas on my childhood every sunday, there were quite inexpensive but everyone did, this is why we just had to invent some copy in order to remember how they tasted, but the angulas had a bite, while this is more like pureé. This last Christmas 2010, the price of angulas dropped down because of the financial situation, but still were 600€/kg, too bad you/we don’t have a time machine.